THE VICE PRESIDENT: No, I don’t. THE VICE PRESIDENT: I’m delighted — I’m delighted I’m about to have a sixth grandchild, Wolf, and obviously think the world of both of my daughters and all of my grandchildren. And I think, frankly, you’re out of line with that question. THE VICE PRESIDENT: I think you’re out of — I think you’re out of line with that question. Q — your daughter. We like your daughters. Believe me, I’m very, very sympathetic to Liz and to Mary. I like them both. That was just a question that’s come up and it’s a responsible, fair question. 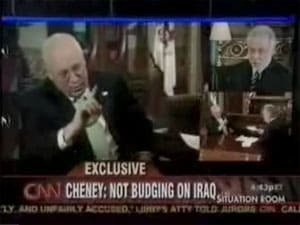 The full transcript of Cheney’s interview, in which he also dismissed as “hogwash” notions that mistakes made in the Iraq war may have hurt his and the administration’s credibility, can be found at the TPM Muckraker.